Shopping for Mars Attacks! Action Figures? Incredible Martian Soldier Action Figure! Based on the iconic Mars Attacks! trading cards. Comes with a pistol, rifle, and ray stick! Are they friend or foe? Based on the iconic Mars Attacks! trading cards that forever changed the face of science fiction and pop culture, comes the Mars Attacks! Martian Soldier 6-Inch Action Figure. 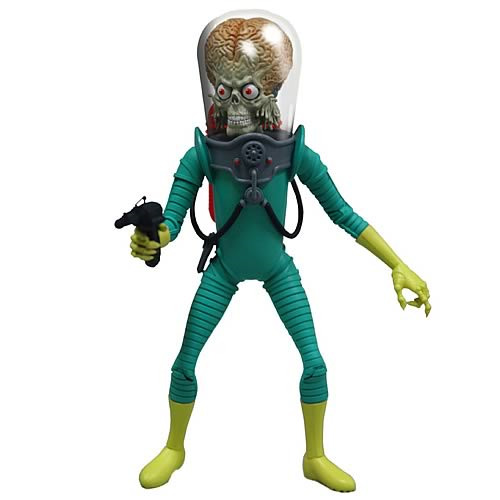 The otherworldly creation features the Martian's signature exposed oversized brain and bulbous eyes, along with his memorable green spacesuit. This action figure comes with a pistol, rifle, and ray stick, and it features 13 points of articulation: neck, shoulders, elbows, wrists, legs at waist, knees, and boots. Think you can trust him? Ages 14 and up. Fifty years ago, Topps unleashed Mars Attacks! on an unsuspecting card-buying public. The lurid cards, which depicted an invasion of Earth by Martians in the style of the B-movies of the time, proved popular and have spawned merchandising, comic books, and a movie.